Welcome to Oasis Eye Face and Skin! Eye surgeon Dr. Vivian Schiedler offers personalized treatment plans that fit your needs and lifestyle. Whether you’re looking for Botox or a brow lift, Dr. Schiedler’s goal is to inform you of all your treatment options. This all starts with a quick and easy visit process. She understands just how valuable your time is, which is why each office visit is as stress-free as possible. At Oasis Eye Face and Skin, we want your experience to be pleasant and efficient. To ensure this occurs, we recommend you follow our initial visit process to help streamline your appointment. You can reach us by phone or online to speak to our front desk receptionist who will send you an email with easy to fill out new patient forms via IntakeQ. There is nothing to sign up for, no passwords, and it is HIPAA privacy compliant. You can enter your medical history, insurance information, medications, and any other pertinent information. This step cuts down on paperwork on the day of your appointment. It also helps us be better prepared for your first visit. If you do not have access to the Internet, we will gladly mail paper forms to your mailing address. Once all your paperwork has been submitted, someone from our office will schedule and confirm your appointment date and time. If you filled out your forms before your appointment, you only need to arrive at our office five minutes early. This prevents you from having to sit and wait. Upon your arrival, we will verify your insurance and ID. For patients who haven’t filled out the forms ahead of time, arriving fifteen minutes early is usually ample time to register and check-in. New patient forms (if not already submitted online). These include: patient registration, medical history, financial policy, and HIPAA consent. Medications, either as a list of all the medications you are taking (including herbs and natural supplements) or the bottles from the pharmacy. Eyeglasses or contact lenses to check your best-corrected vision. Prior imaging including MRI and CT scans (if relevant). Old photographs of yourself as a child and/or young adult. This serves as a point of reference for your most natural look. New patients will be scheduled for 30 to 60 minutes, depending on the reason for the visit. Appointments for non-surgical procedures such as Botox, fillers, microneedling, and chemical peels usually don’t take as long as appointments for surgical procedures. Please allow up to two hours if the reason for your visit is surgical, as this requires meeting with our surgery scheduler to review consent forms, preoperative and postoperative care, new prescriptions, and financial considerations. New patients can expect to have photographs taken to document the medical condition. Some insurance companies require photographs and a detailed evaluation to determine the coverage eligibility. Having someone bring you to the appointment is always a good idea, as your eyes may be dilated during your visit. Eye dilation can make your vision slightly blurry. We wish to make your surgery as smooth and comfortable as possible. Not knowing what to expect is enough to get any patient nervous, regardless of whether they come in for a short in-office procedure or a longer outpatient surgery. To help you feel more relaxed, we strive to educate you on your procedure in enough detail to minimize the “unknown.” We encourage you to share with Dr. Schiedler anything that makes you anxious or concerns you may have so we can make things easier for you. 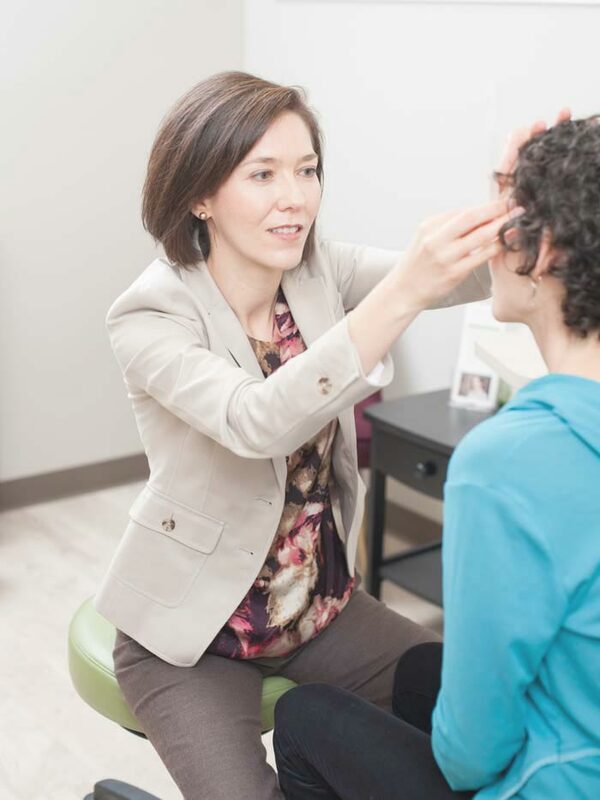 Because the eye area can be sensitive, Dr. Schiedler has developed several techniques for keeping patients comfortable. Please share with Dr. Schiedler about any previous pleasant or unpleasant experiences you have had with surgery, as this will help us ensure your complete comfort. Postoperative appointments usually last between 15-20 minutes. Dr. Vivian Schiedler offers a 30-minute cosmetic consultation for $50. During this session, you will meet with her personally, review your concerns, and she will make treatment recommendations based on your specific goals. Payment is required at the time of scheduling your consultation to reserve this time for you. Please note the consultation fee is non-refundable within 48 hours of your appointment. In most cases, the treatment appointment will need to be scheduled at a later date. We encourage you to call us anytime at 541-500-0165 if you have a question before your appointment, before surgery, or any concerns after surgery. If you’re looking for eye rejuvenation or to restore eye comfort in a natural way that preserves or enhances your eyes’ appearance, turn to board-certified oculofacial plastic surgeon Dr. Vivian Schiedler. Dr. Schiedler along with her warm, dedicated, and professional staff are here to make your visit as seamless as possible. Contact us today to schedule your personal consultation, start the initial visit process, and get on the road to healthy, beautiful eyes.